> Home > News > Recognition for our Distinguished Services! Recognition for our Distinguished Services! 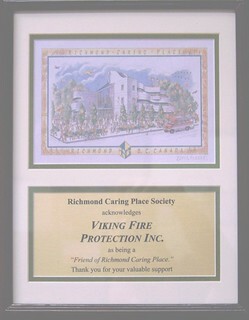 In recognition of its distinguished services, Viking Fire Protection has recently received a commemorative plaque from the Richmond Caring Place Society, a purpose-built facility that houses many of the Richmond's non-profit service agencies. The service centre was very pleased with the good work provided by all our team, emphasizing the contribution of Mr. Bill Birch, Sales Representative at our Vancouver branch. The Richmond Caring Place Society is a non profit organization and is always looking for a helping hand. By providing them with our expertise at a reduced cost, we are proud to contribute in making a difference in our community. We would like to thank the Richmond Caring Place Society for this symbol of recognition. It was a great pleasure for Viking to work on this project.